New Utah Gardener: What Is An "Heirloom" Tomato? 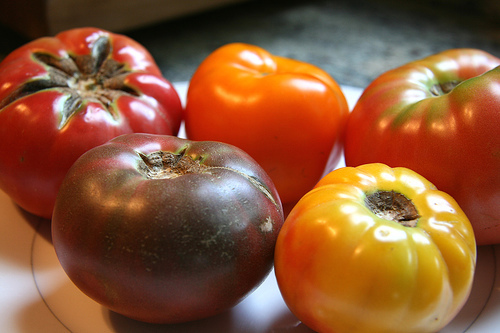 What Is An "Heirloom" Tomato? There has been discussion in recent years about "heirloom" fruits and vegetables. To characterize a tomato as an "heirloom" is to say it is an open-pollinated (non-hybrid) cultivar. Heirloom tomatoes are often older varieties (many decades) and because they are non-hybrid, their seeds can be saved and passed down and shared from generation to generation. That's why the word "heirloom" is used - in the UK they call them "heritage" tomatoes. Hybridized commercial tomatoes, with uniform color, longer shelf-life and disease resistance were grown and promoted by the commercial growers starting in the 1940's. Unfortunately, commercial tomatoes tend to be less flavorful and less sweet than heirloom tomatoes. Heirloom tomatoes are available in a wide range of size, shape and color. There are hundreds of varieties! Their flavors can be outstanding and varied. They can be susceptible to disease (I've rarely had any trouble) and the fruits might not hold up as well as commercial tomatoes. However, the risks and trade-offs can be well worth it! Heirloom tomatoes are delicious and every gardener should try growing some!